Garrity: "I'd like to bring to you, a star in his own right, on the tenor saxophone, it's the Stan Getz quintet..."
"And I know that you'll enjoy Candido on conga, and bonga; and the string section... We got more comin', right now. There's more coming. We're gonna get, gonna get a little sort of a session goin' here, a bit of a session, a session that will feature the rhythm section -- that's with Walter Bishop, Walter Yost, Roy Haynes, Charlie Parker on alto, Candido on the conga, and on trumpet, and on trumpet, a young man named Dizzy Gillespie, doing 'A Night in Tunisia'..."
"And there you have, probably, probably, one of the most tasty trios in the business today, the Ahmad Jamal Trio. Records on Okey label, also tasty. And we have a lot more music for you, of course. We'll have Duke Ellington back, a little bit later. Right now, though, we want to sorta kinda mix things together, and really get something nice, you... first get some strings, like for instance some violins, and then we could throw in a cello, a rhythm section, a harp. Let's see, we have piano, bass, drums... You get something that's real pretty, a real pretty song, how 'bout something like 'Just Friends'? That sounds good. But there's... one more thing, of course, that we'll have to add to this, that kind of makes the whole thing, and that's a fella -- I don't even know why I go through an introduction, but you know him, number one on alto, Charlie Parker..."
Introduced by Parker: "Ladies and gentlemen, along with the rest of the orchestra, Cra, Candido would like to go along with us and give you his interpretation of the tune, another recording we sincerely hope you will remember and enjoy, 'Repetition'..."
Voiceover from 0:09: "Lotsa nice music, huh? Charlie Parker and Strings, ladies and gentlemen, Charlie Parker and Strings..."
"Thank you. We have a request for 'Monologue'... 'Monologue'... (applause) 'Monologue', ladies and gentlemen, is a bit of in -- a tiny bit of interpretive music played by our 'Music in the Foreground' trio, Jimmy Hamilton, Russell Procope, and Harry Carney. They, through the medium of their clarinets, tell a very true to life story, one that we see re-enacted in real life every day, a little thing that seems to happen to some of our best friends, gets dangerously close at times, and I'm sure everyone knows someone wo has participated in this type of episode. It's called 'Pretty and the Wolf'..."
"Once upon a time, there came to the city a pretty little girl. A little country but... pretty! A little ragged but... pretty little girl. There she met a man, a city man: smooth, handsome, successful... a well-mannered-type man. And since she was pretty, he saw fit to give her an audience, so he talked to her for quite a while. Naturally, she wanted to... get somewhere. He was already somewhere. He was standing on the corner, twirling his diamond-studded gold chain around his finger, and as he enumerated the various conditions and ways for her to... get somewhere, you could hear her saying, "Yes, daddy... Yes, daddy... Yes, daddy." And so agreed, they danced. They danced. They really danced -- they gave it a mad whirl. The maddest. Their hearts danced. They virtually spun each other around. And as they came out of their spin -- or rather, as she came out of her spin, because I think he got caught in his (as a matter of fact, he's still in his spin) -- obviously he likes it, because there she is. Standing on the corner, twirling the diamond-studded gold chain around her finger. And as she enumerates the various conditions and ways for him to... get somewhere, we can hear him say, "Yes, baby... Yes, baby... Yes, baby..."
"Thank you. And now, two numbers, recently released back-to-back on one Columbia record, 'The VIP's Boogie' and 'Jam with Sam' (applause)... We combine these two numbers for a bit of name-calling. We start with Harry Carney at the bottom of the horn, we go up to Cat Anderson at the top of the horn. 'The VIP's Boogie', 'Jam with Sam'... Harry Carney..."
Ellington Orchestra. "Don't Get Around Much Anymore," "In a Sentimental Mood," "Mood Indigo," "I'm Beginning to See the Light," "Sophisticated Lady," "Caravan," "It Don't Mean a Thing," "Solitude," "I Let a Song Go Out of My Heart," etc. "And now, our first-chair percussionist... Louie Bellson and his electrifying performance of his own composition, 'Skin Deep'..."
This was a festive all-star night celebrating 25 years of Duke Ellington in the music business. Two concerts (8:15 and 11:45 pm) featured "Duke Ellington and His World-Famous Orchestra, "the one and only 'Lady Day' - Billie Holiday, "'Yardbird' Charlie Parker and His Strings," "The King of Be-Pop - Dizzy Gillespie," "Long Island Sound - Stan Getz," and "The Amad Jamal [sic] Trio." Bob Garrity acted as master of ceremonies for both concerts. These are probably location recordings. WNBC may have broadcast parts of these concerts on a later date (the New York Times radio log has nothing about such a broadcast on November 14th). The Ellington Orchestra probably began the second concert as they did the first -- "Star-Spangled Banner," "The Mooche," "How High the Moon," "The Tattooed Bride," "Lullaby of Birdland," and "The Hawk Talks" -- before the Jamal Trio item listed above. Clearly this was a complex affair with difficult choreography! The Getz Quintet probably performed more than two numbers in the first concert; Fresh Sound FSCD-1003 contains four items from the second concert: "Sweetie Pie," "Moonlight in Vermont," "Stella by Starlight," and "Cherokee." Walter Bruyninckx lists three titles by the Ahmad Jamal Trio, "So Beats My Heart For You," "It Ain't Necessarily So," and "This Can't Be Love." 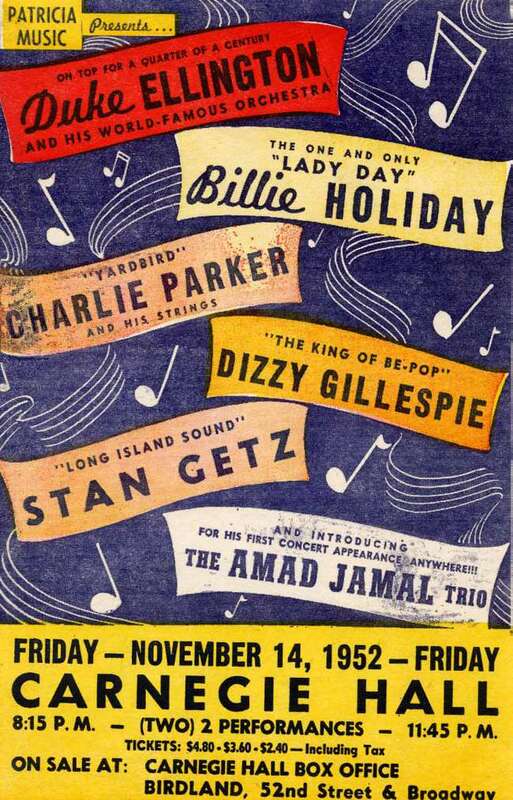 Some of Billie Holiday's performances from these shows have been issued on ESP 3003, Live Performances, Vol. 2. The order of these performances above is very speculative. I am very grateful to Bruno Leicht for his careful reconstruction and pitch-correction, and to James Accardi, Wasaburo Miura, and Chieo Yamada for help with the details of the session.